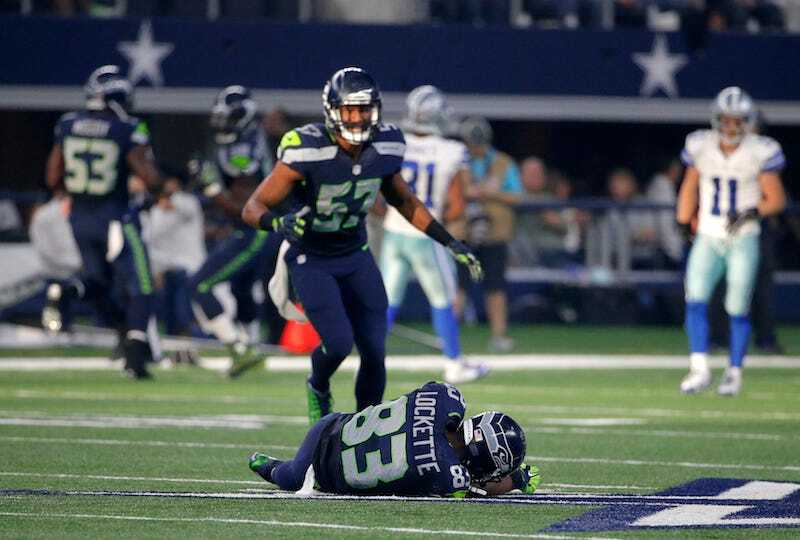 Seahawks receiver Ricardo Lockette said that he was close to death when Cowboys safety Jeff Heath knocked him out with a blindside hit last November. Last Friday, Lockette—who was still wearing a neck brace—visited Redmond Fire Station 11 and thanked the paramedics who properly treated his injury. He explained that there was little margin for error. I didn’t really realize how serious it was until it was over, because the doctor told me my skull was—all the muscles, all the ligaments that connect my vertebrae and the cartilage, in between that. So, the cartilage was out, the ligaments torn. And he said, if I were to have stood up then, the weight of my head, left, right, front, back, I would have died. If one of my teammates would have came over and pulled my arm, just barely, I might have died. If the returner at the time would have broken a couple tackles, and they would have moved and fell on me, I would have died on the field. But what saved my life was the trainers. It’s somewhat of a miracle that an NFL player hasn’t died from a hit on the field.